GoT’s eighth and final season begun on Sunday amid a huge wave of excitement among its fans. F1’s social media team couldn’t resist the opportunity to join the party. Of course, the most natural F1 character who would fit into the world of GoT — based on George R.R. Martin’s book series A Song of Ice and Fire — is 2007 world champion Raikkonen, affectionately known as the Iceman since the early days of his career. His nickname came from the cool demeanour he displays in and out of the cockpit. On Sunday, F1 tweeted a picture of Raikkonen as the Night King, the leader of the White Walkers who live in the icy world beyond the wall.We can safely assume that the similarities between the two end with the ice, however, and that Raikkonen’s intentions aren’t quite the same. 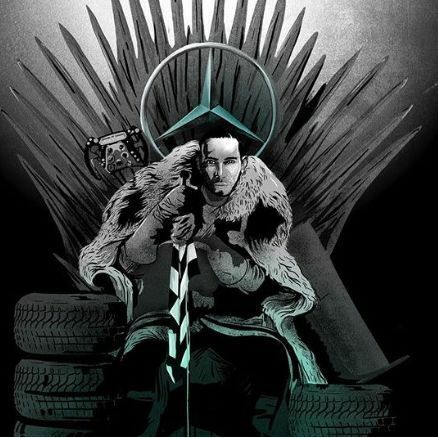 In a post to Instagram on Sunday, F1 adapted a famous quote from the series — “in the game of thrones, you either win or you die” — and portrayed reigning champion Lewis Hamilton sitting on the spikey throne, seated beneath Mercedes’ Three-Pointed Star instead of a coat of arms, while holding a chequered flag (instead of a sword) and surrounded by a stack of tyres.